I made several bags of these to take to my MOMS club cookie exchange this year. Each round is made from my vanilla-almond sugar cookie dough. The hand-piped decorations are done in royal icing for a snappy texture which compliments the short cookie very well. Clockwise from top: 3-D wreath, HO-HO-HO, raised Snowflake, 3-D Holly cluster, raised Joy Center: Santa’s ‘stache in 3-D While it doesn’t show very well in the photo, the all-white cookies are covered in a generous dusting of iridescent white and silver edible glitter for a wonderful winter wonderland effect! 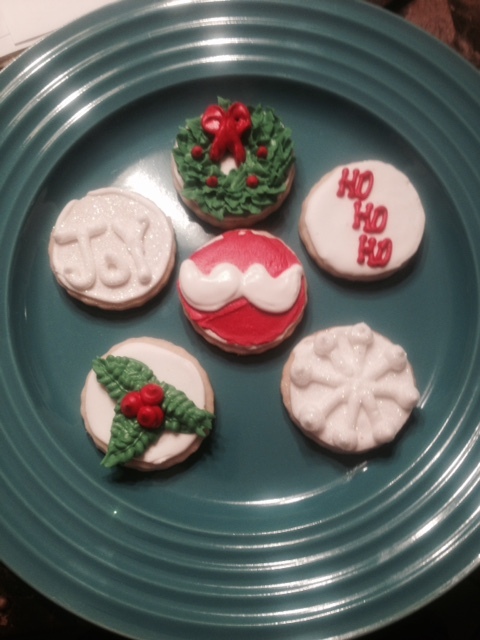 Posted in UncategorizedTagged christmas, christmas cookies, cookiesBookmark the permalink.